The Meat Departments at Adams Fairacre Farms place tremendous value on the relationships we have with our customers. We are always seeking out the highest quality, healthiest, and most conscientious products we can find for you. This mindset has led us to the beautiful hills and pristine mountains of Northeast Georgia to bring you our Farmstand Fresh Chicken. Ralph and Mary A. Adams began our company nearly 100 years ago guided by the principles of Family, Quality, Relationship with Community, and Stewardship of the Land. Using these principles we have found the chicken we believe they would approve of, and have confidence featuring at their Farmstand. Raised by a community of Farmers near Springer Mountain in Georgia, our Farmstand Fresh Chickens live cage free in spacious houses which provide a stress free environment with plenty of room to roam and an abundance of fresh, mountain water. Our chickens are fed a pesticide free, vegetarian diet of corn and soybeans, and are raised without the use of antibiotics, growth stimulants or hormones, or animal by products. 100% of the corn and soybean used is grown in the USA. Recognizing high quality living conditions makes for a healthy, less stressed, and ultimately safer and better tasting chicken. The farms and facilities used in raising Farmstand Fresh Chickens are certified and audited by the American Humane Association. Making the welfare and comfort of these chickens a top priority is something we believe Ralph and Mary A. would have done in 1919, so we continue doing it today. We concentrate on these principles not only to ensure the quality of the meat you put on your table, but also to honor the process, the farmers and families, workers, and animals who give their lives and livelihoods for our sustenance. The result is a delicious, tender, and healthy chicken you can feel confident in using in all your recipes, both the special and the routine. Our Farmstand Fresh Chicken is yet another product we are proud to provide for you and your family, and we appreciate the loyalty, trust, and partnership you have with us as you shop our Meat Departments. See you at the Farmstand! Today we all want to know as much as possible about the meat we eat. At Adams Butcher Shops, we feel just the same way. It’s important to our customers that the meat be super fresh, as local as possible and that it’s pure meat, no fillers. So, that’s what we provide. The majority of Adams meat doesn’t travel far to come to us and we select for the highest quality and excellent farming practices. Whether it is a brand name, or under the Adams Brand, it is good meat to use, freeze and trust to feed your family and friends. We feature Greater Omaha Hereford beef, grass fed beef, all natural Bell & Evans chickens, local all natural Campanelli’s chickens, Plainville turkeys and locally raised lamb. You’ll find the finest quality pork available and small game, too. And so much more: We carry store-ground hamburger (80, 85, and 90% lean) and meatloaf mix, store-made sausages, a great range of Adams brand smoked sausages, bacon and pork chops, Boar’s Head hams and hot dogs, local game meats, Cornish hens and the list goes on. Adams butchers take pride in their work. Don’t be afraid to ring the bell or ask for something special. Be sure to pre-order your Thanksgiving Turkey, a prime rib roast for a special occasion, or lamb for Orthodox Easter. Every holiday, the centerpiece of the family feast comes from Adams, and they fly out of the store in amazing numbers. "We'll always be the old fashioned butcher," says Fred Brill, Kingston Meat Department Manager. We strive to provide customers with the highest quality and most delicious meats, whether organic, grass-fed, local, or raised on family farms across America. Find out why our butchers love what they do and why they call it "The Adams Way". 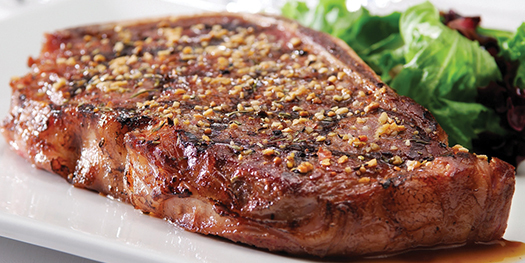 A quick resource for your questions about cuts of beef and preparation methods: Click here. Adams lamb is raised in the Hudson Valley, grass fed and delicious on the barbecue, roasted or ground for Greek, Middle-Eastern, Indian and other dishes.